Clickbait Nation | Were Donald Trump’s 2005 Taxes News? Clickbait Nation | How Do We Get Good, In-Depth Reporting? 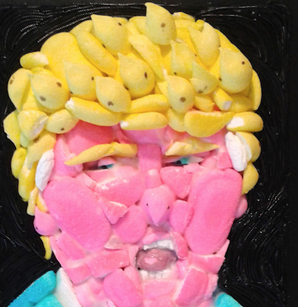 Well, screw with the President and lose arts funding; screw with the arts, and someone makes a portrait of you out of Easter marshmallows. Although other Presidents and Congresses have cut these agencies (George W. Bush, a hobby painter whose wife was a former public school teacher, proposed cuts of 10% in some years), threats of a diminished federal commitment to public broadcasting, and to humanities and arts funding, have been a consistent feature of the political landscape since 1982. Will Donald Trump be the President who succeeds in doing away with federal cultural funding completely? I don’t think so, although as usual, there may be token cuts. This is why, and this is what you can do. The arts and humanities have many lobbyists: support them. Scholars, have you ever wondered what really happens to your professional association dues? Yes, they go into managing the organization, and paying staff salaries, although not in the lavish way some members of the Modern Language Assocation (MLA) have charged in the past. But a big part of any professional association’s job is to prevent federal cuts to programs and institutions that support our scholarly work. These folks are backed up by major public and private universities that (gasp!) educate students regardless of their political affiliations. So the first thing you can do if you care about what happens to cultural funding is join your professional organization, now. The second thing is to organize an email campaign to your senators, particularly if you work at, or are a graduate of, a flagship public university in, for example, Nebraska. Or Utah. Or Kansas. Or — well, you get my point. Outside universities, there are local and community projects all around you that receive federal funding: become acquainted with them, patronize them, and give them money to survive whatever cuts are levied in the final federal budget. Every state — red and blue –has its own humanities council. All of these smaller councils get a significant part of their funding from the government, and this funding is redistributed to libraries, local historical societies, and community education projects. None of these organizations ask at the door whether you voted for Donald Trump or Hillary Clinton. a series of conversations to bring together hundreds of residents and dozens of businesses to talk about how they can make their county a better place to live, work and play. Last year, 38 small pop-up exhibits on the Bill of Rights were given—for free—to Indiana schools, libraries and other nonprofits in celebration of its 225th anniversary this year. And last month, a group of teenagers clustered around a visitor to Franklin Central High School, jockeying for position with smartphones and snapping selfies. Their guest? Indiana poet Adrian Matejka. t’s a stretch to characterize this work as federal overreach, or what we used to call pork barrel spending, before we liberals insisted it was politically incorrect to shame pigs by comparing them to politicians. My guess is that cultural funding cuts have been included in the budget — as they are in every cycle — as leverage for the GOP to get other things they want. Like a collection of shiny new nuclear warheads, and a beautiful wall that will keep United States citizens from fleeing illegally to art colonies Mexico. But here’s the other reason why — with your phone calls, letters and emails (find your Representative here and your Senators here) — these agencies will not be cut: they are a tangible and visible way to put federal dollars into local communities, and our representatives in Washington like doing that, regardless of party affiliation. I can’t be the only person who received a personal note from my Senator congratulating me on my NEH grant, can I? And not every town can be lucky enough to have a nuclear arsenal ginning up the local economy. Hence, expect significant pushback on these cuts from moderate Republicans, and their constituencies, during a budget process that promises to be a real doozy. Am I telling you not to worry? Of course you should worry. But don’t panic — organize — and don’t let this distract you from lobbying your Representatives and Senators about military appropriations either, which are slated to go up by $50 billion in the new budget; or the proposed 37% cut in State Department funds. Because, to the extent that they are capable of planning anything, it is my guess that distracting arts-loving liberals is the whole point of this maneuver. I think you’re absolutely correct, although I think the point of this is also to placate the tectonic pieces of the Republican party that are threatening to break off from Trumplandia and go searching for their self-respect. I hope you’re right, but my experience with a vandal administration in Alabama that wanted to show it was fiscally conservative by defunding 12 cultural state agencies (saving all of $1.2m) makes me fear you’re too sanguine. In AL, the attacks were not about actual savings but about attacks on rural cultural institutions that conservative votes living nearby liked but were ideologically opposed to. That is, their hatred of spending led them to agree to cut local revenue generators, and the Gov (predecessor of our current Luv Guv) got a win for . . . whatever. At least 2 of those institutions have died because they couldn’t retool their business model. I fear the best we’ll see is steep cuts that leave the NEH-NEA-PBS admins in the position of spending all their time trying to raise money while they cut staffs. This is the CEO-Wins-All model at work, and has little to do with rationality, IMHO. I’m happy to be wrong on this.